Today’s post is just a quick follow up to the last one, on using HFM dimension tables. The disclaimers from the last post still apply. We will be looking at additional code to generate the dimension extracts from HFM’s Account tables. 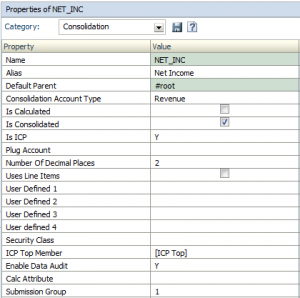 As mentioned in the last post, the accounts dimension has additional attributes and additional tables to take into account while setting up the metadata extract. 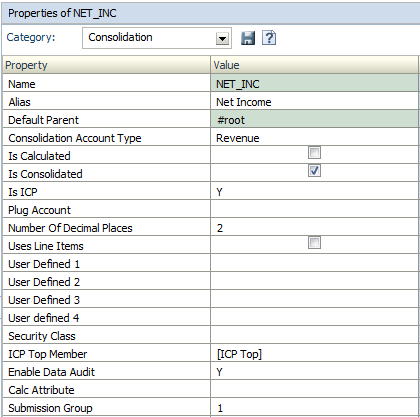 For instance, the ACCOUNT_ITEM table tells us that we can derive attributes such as Account Type, IsICP, PlugAccount etc. from the base table. EPMA confirms the above, but in a more user-friendly manner. I hope the direct correlation between the columns in the screenshot above and below is not lost on anyone. ACCOUNT_ITEM table: This will help us get the PlugAccount. The join can be done through the ITEMID and the PLUGACCOUNT columns. ICP_ITEM: This will allow us to get the ICP top member name. ACCOUNT_CUSTATTR: This will allow us to retrieve the Custom dimension top members. The NVALUE column will be used to perform the join. CUSTOM_ITEM: this table, which we are familiar with, from the last post, will provide the names for the custom dimension top members. Notice, there are additional joins needed for each custom dimension you may have in your application. For each custom dimension in your application, you will need to retrieve member names from the CUSTOM_ITEM table. Of course, there may be more elegant ways to do this, but, this works for me. And finally, our query gives us the results that we need.